We love the Kindertrauma blog. And are also quite disturbed by it. Kindertrauma delves into the recesses of your memory and reminsces about the things that terrified you as a child. Movies, TV, books, toys ... all the tiny terrors that you can't possibly understand at a young age. When I was nine, we moved and I met the girl who lived down the street from us, and one day she and her family (older sister? I couldn't have been her mom...) took us to see 'The Deep" with Jacqueline Bisset. Which was rated R. Which there was no way my mom would have OK'd, had she known. Which includes a scene where creepy voodoo bad guys break into Bisset's hotel room and draw on her stomach with a CHICKEN FOOT DIPPED IN BLOOD. Did I understand the rest of the plot? God, no. I don't even understand it reading the Wikipedia page I linked above. A sunken ship carrying morphine ampules? Wha? But I'll never forget that damn bloody chicken foot, which wasn't even considered important enough to mention by whoever wrote the Wikipedia entry. Kindertrauma also has a "Name That Trauma!" regular feature for those traumas you don't remember the names of. Brilliant. In the spirit of Kindertrauma, share your horrifying, childhood-destroying pop-culture memories. Come on, you're among friends. By the way, the actress whose eye apparently gets split in this Kindertrauma entry (it was a dead cow's eye) later immolated herself in public. Shudder. And now we pay thousands of dollars to have our eyes split for laser surgery. And I totally agree, THE DEEP was pretty traumatic. Okay, I have two. The episode of the Waltons where the house catches on fire (1976? )...especially the image of one of the girls half-burned doll in the smoking remains. Yes, I saw "The Deep" when I was 9 (turned 10 three months later) and also with my brother, just turned 8 at the time, saw this with our parents. My dad is an electrician by trade and had wired the new cinema that was built near us. I vividly remember the bloody chicken foot on her stomach and navel. I don't remember how far into the movie it was though because I keep missing it when that part when it airs on the movie channels. It wasn't really traumatizing to me as I had seen "Jaws" and "The House That Dripped Blood" with Christopher Lee when was I was a little younger. 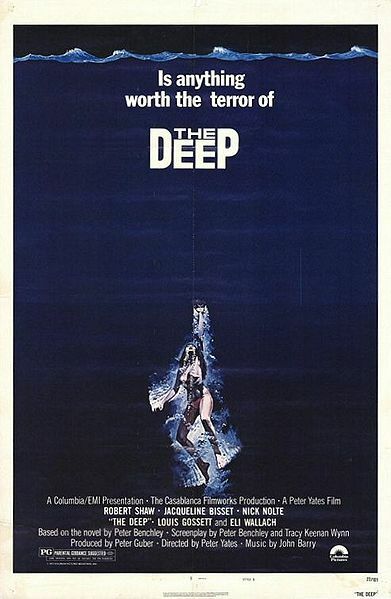 The later re-ran in another theater 2 years before I saw "The Deep"
1) all Jacqueline Bisset's scenes and nice ta-tas!